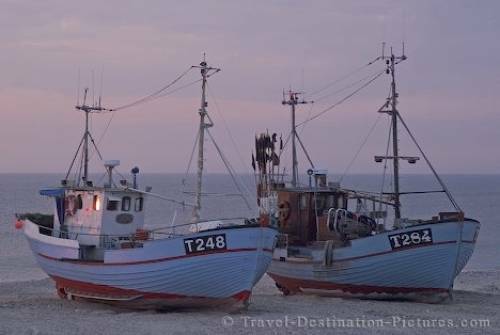 The fishermen at the danish west coast are still working with small boats, setting their nets with buoys while operating out of sandy beach harbors. In these harbors the boats are simly dragged on the beach by winches and pushed back in the water by tractors or again by winches. Especially in the town of Vorupoer one can enjoy lovely evening strolls between the boats in the sandy harbor, bathed in the warm lights of sunset. on the beach in Vorupoer, Denmark.